August, 1906. Sun. 12. Fair. - At mtg. morn. & Baraca class. Mon. 13. Mr. Torrey hurt 13th. Fine day. - Took morn train on G.A.R. 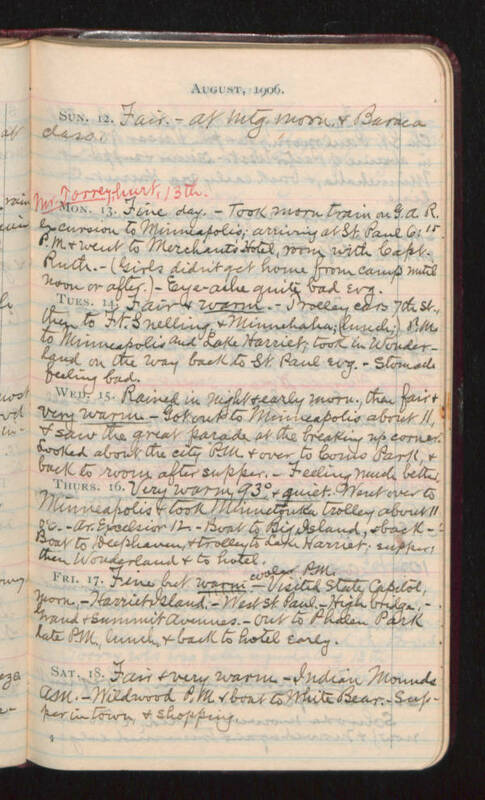 excursion to Minneapolis; arriving at St. Paul 6:15 P.M. & went to Merchant's Hotel, room with Capt. Ruth. - (Girls didn't get home from camp until noon or after.) - Eye-ache quite bad Evg. Tues. 14. Fair & warm. - Trolley cars 7th st., then to Ft. Snelling & Minnehaha; (lunch;) P.M. to Minneapolis and Lake Harriet; took in Wonderland on the way bad to St. Paul Evg. - Stomach feeling bad. Wed. 15. Rained in night & early morn., then fair & very warm. - Got out to Minneapolis about 11, & saw the great parade at the breaking up corner. Looked about the city P.M. & over to Como Park, & back to room after supper. - Feeling much better. Thurs. 16. Very warm 93°, & quiet. Went over to Minneapolis & took Minnetonka trolley about 11 o'c. - Ar. Excelsior 12.- Boat to Big Island, back - Boat to Deephaven & trolley to Lake Harriet; supper; then Wonderland & to hotel. Fri. 17. Fine but warm - cooler P.M. Visited State Capitol, morn - Harriet Island. - West St. Paul. - High bridge. - Grand & Summit Avenues. - Out to Phalen Park late P.M., lunch & back to hotel early. Sat.18. Fair & very warm. Indian Mounds A.M.- Wildwood P.M. & boat to White Bear. - Supper in town, & shopping.